Every client’s requirements are unique when they hire Bailiffgate. You may need shorter or longer time. You may want a particular room set-up, or for us to help you arrange catering, or a speaker. Bailiffgate offers a unique venue for holding meetings, launches and events when it is not open to the public. The Museum is located in the former St Mary’s Church, dating from 1836, in “The Castle Quarter”, one of the oldest parts of Alnwick. The heritage of North Northumberland is brought to life on the main (lower) floor of the museum, which your visitors will be free to tour after your event. 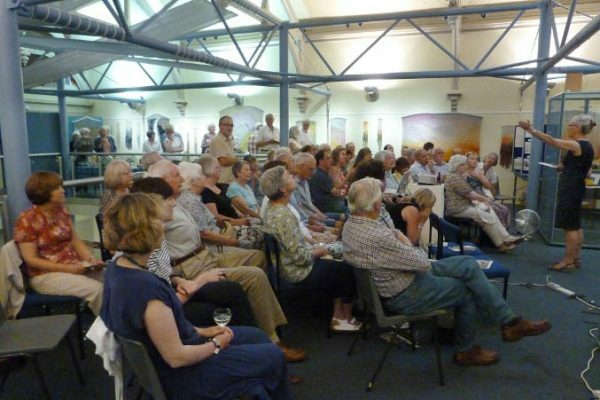 We also have a unique programme of exhibitions in our upper floor gallery, so that those attending your event could be surrounded by the added interest of, for example, a show of local art or photography. Flexible: Offering boardroom style seating for up to 25 people or a reception area for up to 100. We are available during the evenings all year round, and all day on Mondays. We are will always try to accommodate your requirements. Refreshments (tea, coffee and biscuits) can be provided, we can arrange a buffet or accommodate your choice of catering contractor. We hold a Premises License for Entertainments. Equipment available includes a digital projection system with twin speakers, providing high-quality rendition of your slide shows and videos. Convenient: Within easy walking distance of Alnwick town centre. Accessible straight off the A1- with train, bus and airport links and with a large variety of overnight accommodation in and around Alnwick for those delegates who may require it. Ideal for non-delegates too with Alnwick Castle and Gardens, Barter Books, numerous golf courses and beautiful sandy beaches nearby everyone will find something of interest. Cost effective: With venue hire from as little as 16p per delegate per hour (exclusive of catering). This is only a sample to illustrate how extremely cost-effective a venue Bailiffgate can be for such an exceptional location and ambience. We strongly encourage you to contact us to discuss your exact requirements and your preferred date.